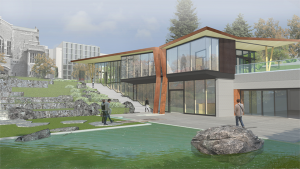 On September 12, 2016, UBC president, Santa Ono, announced the start of construction on the Indian Residential School History and Dialogue Centre at the Vancouver campus. The announcement, which took place at the UBC First Nations Longhouse, was live streamed. The archive of that announcement is available below. The Centre, affiliated with the National Centre for Truth and Reconciliation, will provide a more accessible place on the west coast for former students and survivors, their families and communities to access their records and other historical material that the TRC and others have gathered, and to have a place to discuss their experiences, the history, and its effects and implications. Another purpose is to provide public information for UBC students and students from other universities and schools, and for visitors who will visit the Centre in person or online. It will also be a place for the development of advance curricular and digital materials for classes at UBC and elsewhere, including K-12 classrooms. Finally, the Centre will also provide a place to develop advanced curricular materials for classes at UBC and other post-secondary and K-12 institutions, using interactive technology that can be replicated in many other places throughout Canada and elsewhere. The Centre will be located at the heart of campus, on the traditional, ancestral and unceded territory of the Musqueam people.